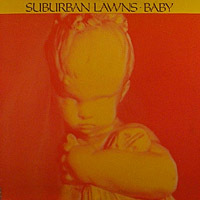 Suburban Lawns formed in Long Beach, California in 1978, though several members had know each other longer and played together previously under various names such as The Fabulons or Art Attack (two were students at the famous Disney-backed California Institute of the Arts or "CalArts"). They found their stride with a quirky tune called "Gidget Goes To Hell" released in 1979 on their own indpendent Suburban Industrial Records and got a boost when a music video (purportedly produced and directed by Academy-Award winning director Jonathan Demme) for the tune ran on Saturday Night Live. Thanks to continued airplay (thanks to Rodney Bingenheimer & KROQ), the band was able to license thier self- produced debut LP to I.R.S. Records for a whopping $25,000 -- more than it cost to produce -- and get picked up by Ian Copeland's Frontier Booking International. The arrangement gave them terrific opportunities to open for and tour with dozens of great UK and US bands. 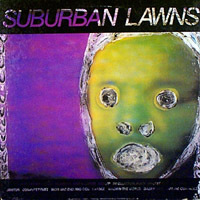 Suburban Lawns on stage in the San Francisco Bay area, circa 1981. 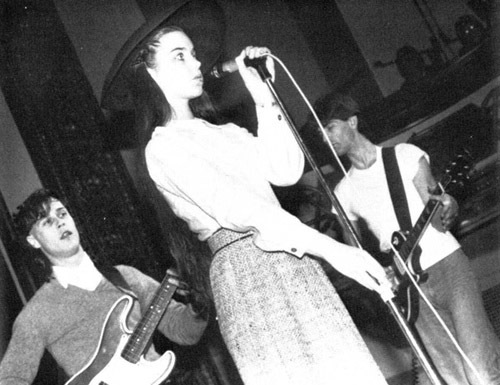 (L to R: Vex Billingsgate, Su Tissue and John McBurney) The five members of Suburban Lawns took on stage names that would put smiles on the faces of anyone culturally literate: Su Tissue (Sue McLane), Vex Billingsgate (William Ranson), John Gleur (John McBurney), Frankie Ennui (Richard Whitney) and Chuck Roast (Charles Rodriguez). Su was the usual "front-person" though lead vocal duties switched from song to song with everyone except Chuck Roast singing at least one song. Despite the regional success of the debut LP, a follow-up was a long time coming. And a long time in the pop-world often leads to turmoil brewing within bands. Shortly after Richard Mazda took on production of the their follow up, Baby (which ended up as an EP), John McBurney departed the fold. Other issues took their toll and Baby was released with little fanfare and less promotion. Soon after it hit the street the band folded. Despite a "fan club" address on the sleeve the Lawns were done. "Gideget Goes To Hell"/"My Boyfriend"
HEARING AIDS (no number) includes a very different extended version of "Flavor Crystals"
Anna Summa Photography's website has an interesting picture of Su Tissue here. 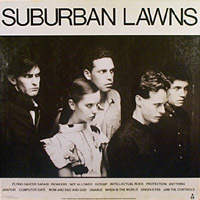 Trouser Press's Suburban Lawns page. The "Art-For-A-Change" website features Mark Vallen's Slash Magazine cover drawing of Su Tissue. ©2004 Mr Bill's I.R.S. Corner. All rights reserved.